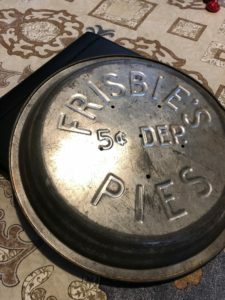 Did you know that the original frisbee disk was actually a Frisbie pie company 5-cent deposit pie plate? I happen to own one. This company existed in New Haven CT, and the students at Yale, in particular, found it entirely OK to sacrifice the 5-cent deposit fee to be able to toss the disk around for fun. A classic was born from a sustainable and common-sense approach to the pie business. 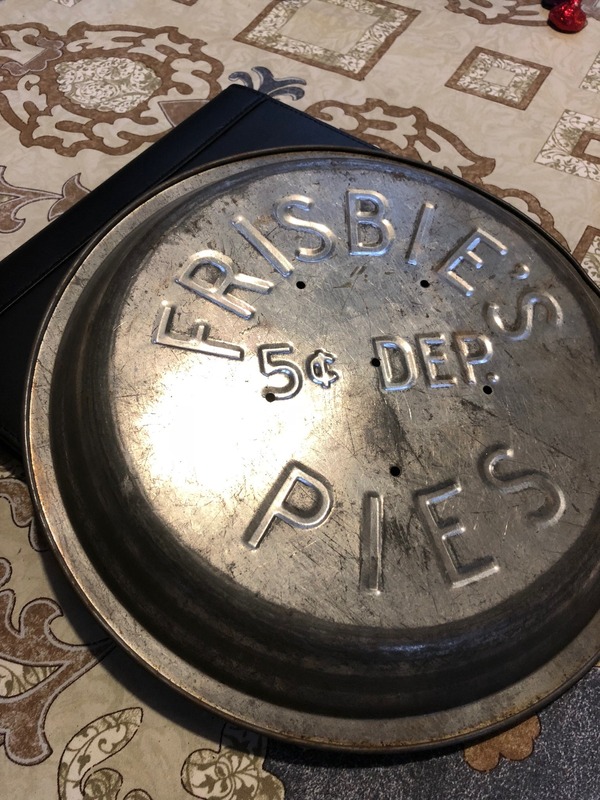 The company embraced the fun side of their utilitarian pie plates for a time, accepting the slight yearly reduction in number of returned pans. They eventually sold off the name and the concept for greater gains. Occationally I receive the classic FB post about the old woman in the store who is lectured about sustainability by the young clerk. She then educates the clerk by sharing her memories of the daily grenness she grew up with including gathering twine in a drawer, reusing bags, saving paper wrap, and using vegetable cuts for stock. Comon sense frugality. I have become nostalgic for times when convenience did not over-ride common sense. I am nostalgic for the time when convenience did not override common sense. At restaurants they put already opened plastic straws into every glass because that is more convenient than responding to individual requests for straws. We throw away 500 million straws EACH DAY in the USA. We drive single occupancy vehicles to work, even if we live on a bus route, because it is more convenient to not have to worry about the transit route schedules. Even though we have to pay for parking, fill up with gas, maintain the car, pay attention while driving, and deal with driving stress. God forbid anyone suggest carpooling – imagine the inconvenience of arranging all those schedules and needs just to benefit from the shared savings, reduced angst, and increased societal connectivity? We buy in bulk because a one-stop shopping trip is more convenient and cheaper, but we then trip over cases of paper towels and canned soup and bottles of soda in our kitchens and hallways (bigger house anyone?). And I can’t tell you how many expired granola bars we’ve thrown away after accumulating too many to manage, via automatic monthly delivery, which is so very convenient. We pay four times the cost of gasoline to have “convenient” single use bottles of water that we then have to throw “away”, wherever that is. And that water is less regulated for quality than our tap water, a pain to transport, takes a lot of space to store, and is detrimental to our environment’s health. We use loud, gas-fume-spewing lawnmowers on our tiny city yards, because an electric cable to an e-mower or the sweat of pushing a real mower is inconvenient. We use drive through services and claim they are convenient, when they take about as long as going in, have lesser service, often get orders wrong, and increase emissions as well as personal lack of exercise. Lately I’m looking for ways to redefine convenient. I’m striving to understand long-term convenience over short-term, and opting to do things such as hang up my clothes to dry (and add moisture to my house) rather than throw them into a dryer and use a humidifier. Both convenient on their own, I guess, despite the energy use and the wear and tear on the clothes, but certainly mutually inconvenient. How’s that for a concept – mutually inconvenient. Driving to the gym when I could occasionally walk the three miles to work to get my cardio in, for example. A better way to phrase it; How can I find things that are collaboratively convenient? How can we do the things we already do in a way to become collaboratively convenient, and likely more sustainable? I have seen an increase in delivery options in the realm of sustainability and local foods. CSA (Community Supported Agriculture) deliveries and milk delivery are starting to seem normal in some parts of Albany. Knowing your local farm is collaboratively convenient in that the local economy becomes more resilient, there is awareness and potential avoidance of toxins in the food, and the local systems reliant on pollinators are naturally strengthened by the increased demand. And, regarding milk delivery, no more hauling home a gallon of mile every other day for my teenager who is, apparently, entirely fueled by milk. I think the move to home delivery as a whole, even including restaurant delivery and home prep meal kits could remain collaboratively convenient and sustainable if the systems are devloped as community-based, and if they ensure the packaging is cradle-to-cradle in concept. These goals would ensure resiliency in the local economy and sustainability of resources. The access would build neighborly ties, and help people become aware of the specialities in their own region due to weather, soils, skills, culture. And maybe we can bring back deposit pie plates full of yummy local fruit pies. Yeah, I’d sign up for that delivery.